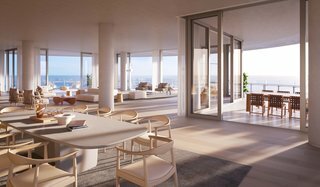 Renzo Piano Building Workshop is positioning a new private residential building as the "beacon" on Miami's North Beach, nestled between a 35-acre public park to the south and a private park to the north. 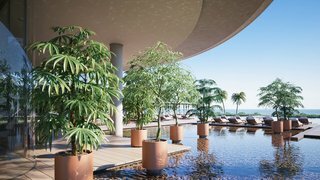 As a luxury condominium destination that's being developed by Terra, Eighty Seven Park is offering a whole new set of prime oceanfront real estate in "The Magic City." 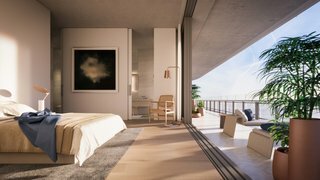 The beautiful residences are being designed by the Pritzker Prize-winning architect Renzo Piano, who found a certain serenity "in the tension between sky and earth"—a serenity perhaps best found in the uninterrupted views of the surrounding coastal sanctuary and the extended green space of North Shore Park at the northern limit of the project site. 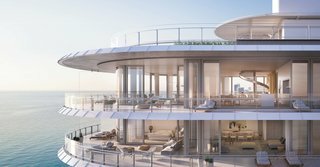 Take a peek into the expansive residences that seem to float over the ocean. The materials and color palette were inspired by the surrounding natural elements of North Beach. 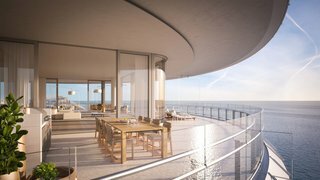 As the only residential building in the city that sits atop the ocean and encircles multiple parks, the structure captures breathtaking views at every turn. Composed of 16 floors of glass-and-steel plates that are surrounded by suspended decks, the building was envisioned as a three-dimensional polygon. It floats over the local flora and fauna including trumpet trees, oak trees, and palms put in by Rotterdam-based landscape studio West 8. 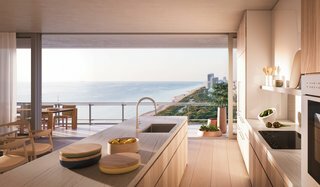 Inside, all the apartments were designed so that upon arrival, the resident is connected to the view of the ocean and the city of Miami. 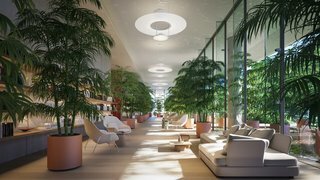 Together, the landscape, architecture, and ocean create an oasis inside an interior that faces outwards toward frameless floor-to-ceiling windows that line the building’s public spaces and 70 residences. Designed by RDAI, the indoor environments have a sense of lightness and a neutral color palette inspired by the natural elements of North Beach. The individual condos feature customizable bathroom hardware, vanity basins, and kitchen cabinetry. Throughout the interior, window frames are sunk into the floor and ceiling, erasing the sense of space between inside and outside. 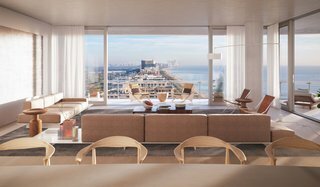 The condos are outfitted with light oak and Venetian terrazzo floors. Inside, all the apartments were designed so that they're connected to the view of the ocean and Miami. Notably, the interior is outfitted with found items gathered from around the site including stones, sea shells, grass, driftwood, and seagrass. The resulting effect creates a mise-en-scène that extends from the inside out. The neutral light oak flooring completes the organic decorative elements, while the Venetian terrazzo floors echo Miami’s white sand beaches. The organic-inspired motifs contradict the intricate attention to detail found throughout. Eighty Seven Park is set to be completed in late-2018. Sales are now open started at $2.4 million.